Most of my time as a business development professional was in the days before we had the internet. I wonder how I survived without Google. I remember subscribing to newspaper clipping services for leads. I periodically visited the local college library to research markets and clients. Mostly, I got on the phone and called people for information. Now most of that information is readily available on my computer. And still, many A/E firms do little in the way of market or client research. The neglect is hard to understand. For one thing, research is so much easier these days! I don't advise giving up actually talking to clients and others in your network, but there's so much information and insight that can be gleaned from online searches. When marketers tell me they don't have enough time to take advantage of this, I think of all the hours spent in the library where I'd usually end up with less information than I can collect online in 20 minutes today. Plus, market research delivers tangible results. In one study conducted by Hinge, professional service firms that did frequent research grew about 10 times faster than those that did none, and were almost twice as profitable (see the Hinge chart below). 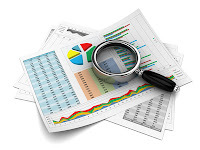 The correlation between market research and performance undoubtedly involves other factors. Firms that do regular research are probably more proactive overall, giving them a competitive advantage. They likely have greater discipline in their business development approach, and focus on fewer markets (another statistical indicator of better performance). Start with your clients. The general state of the economy affects clients differently. With state and local government budgets in crisis, for example, there are still many anomalies—state agencies and municipalities that are spending money on the kind of work your firm does. Talking to clients is the best way to sort out where those opportunities are in the next year or two. How do you anticipate your needs changing in the next 2-3 years? What are the biggest challenges you will be facing during that period? What different consulting or design services might you need that you haven't used in the past? What are the most important projects that you expect to do in the next 2-3 years? In surveying clients, you'll probably get better results with a third party asking the questions. If you don't want to hire an outsider to do it, enlist someone in your firm—particularly someone at the executive level—who hasn't been directly involved in doing project work for the existing clients included in your survey. That way, you're more likely to get open, honest responses. Draw on your network of contacts. Besides clients, you undoubtedly have other people you trust to give you good information and insight on what's going on in the markets you serve. If you don't routinely talk to those in your network, that's another resolution to consider for 2013. As I've written before, you'll find your networking more productive when you focus on helping others rather than just seeking help. Be prepared to share information and leads with those you contact. Others will almost certainly reciprocate. Clarify your online research objectives. It's easy to waste a lot of time searching on the internet when you haven't clearly defined what you're looking for. Yes, web searches often unfold like an investigation, where one finding leads to another, which leads to another. But it's best to put some boundaries on your search so that you don't go too far afield or too deep into the weeds. This is particularly important if you delegate this task to someone else. Again, some standard questions help: What specific information would you like to know (and keep up to date about) for each of your target markets? What do you want to know about existing or prospective clients that might be found online? Identify your most reliable online sources. I have several go-to sources (e.g., Hinge) that I rely on for research and tips relative to my consulting practice. Whenever I find another good source, I bookmark it in my "top sources" folder. I check these sources' websites at least monthly (typically when working on the latest edition of my ezine) or when looking for specific information. My current best source may surprise you—Twitter. Over time, I've identified those who regularly tweet the most helpful information, not in the tweets themselves but the included article links. I try to quickly check these every few days, clicking on the links that look promising, skimming the referenced articles, and bookmarking them in the appropriate folder if they appear useful. Another option is to have your top sources send helpful information to you in the form of email newsletters or periodic updates. That can save you some time looking for it. Be sure to occasionally cull your mailbox of sources that aren't meeting your needs so you're not overwhelmed with unnecessary emails. It doesn't take me long to compile more information than I can use—until I get that call from a client looking for something specific, an article about which I just so happened to have bookmarked a few weeks ago. The point is, with good sources you don't have to work too hard to compile some helpful research. Correlate capital improvement plans with current news. I have done online market surveys for a few of my clients—for example, looking at the municipal water and wastewater market in Virginia. You can find CIPs or similar documents for most public agencies, but often these represent more a wish list than a definitive plan, and the timing of projects is often inaccurate. With nearly all newspapers now online, it's relatively easy to check on what upcoming projects or issues that might become projects are currently in the news. You might be surprised how few of your competitors are following the developing news of prospective public projects in this manner. Learn about prospective clients before you contact them. Before I meet with anyone, especially a potential client, I try to learn what I can about him or her online. On LinkedIn, I might learn about that person's work history and college attendance. With a general Google search, I might find that this individual is involved in a certain professional association or has a side business as an artist. I rarely divulge what I learned to the contact, although it's publicly available information (perhaps my teenage daughter's characterization of "stalking" people on the internet sticks in my head). I certainly don't like the old salesman trick of trying to find affinity in personal information ("I see you like fishing; I like fishing myself"). But what I learn through my internet search can provide valuable context for better understanding the person I'm trying to get to know. Bottom line, market and client research is extremely valuable and has never been easier to perform. If your firm is not doing what it should in this area, there's no better time to start than now. What you learn could make a big difference in how your firm fares in the new year.